(Phys.org)—There are a lot of things that are hidden from our sight, and NASA's James Webb Space Telescope is going to open up another world in the way we look at the cosmos. 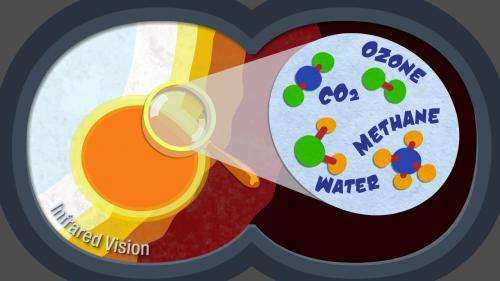 The Webb telescope is going to do that by looking beyond visible light at infrared light, and that's the focus of a new light-hearted, educational animated video. 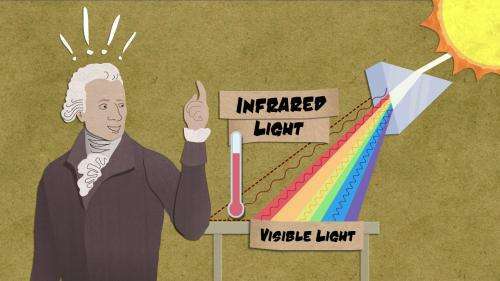 Viewers will learn about the discovery of infrared radiation, and the electromagnetic spectrum, using simple examples to show objects that may be hidden from visible sight, but apparent in infrared light. Infrared vision enables us to see through gas and dust to warmer objects, like stars. Viewers will also learn what "redshifting" means and what questions can be answered using the amazing new detectors of infrared light being developed on NASA's James Webb Space Telescope. "We found that one of the main questions that gets asked about Webb is, 'Will it be able to see the same things Hubble sees,' or 'Why doesn't it see visible light? '," said Tracy Vogel, scriptwriter at the Space Science Telescope Institute (STScI) in Baltimore, Md. "This video was an attempt to answer that question—which is a pretty complicated question—in a fast, uncomplicated way. You can explain that using calculations and charts, or you can explain it using rubber duckies and sneezing planets. We like rubber duckies, and we think other people prefer them as well, so that's what we went with." STScI created the new video called "Infrared: Beyond the Visible," to help explain the purpose and benefits of using infrared light in astronomy. Infrared light is electromagnetic radiation that has longer wavelengths than visible light. Basically, it's thermal radiation, or heat emitted by objects. The video illustrates how visible light emitted long ago by stars and galaxies far away can be stretched to longer wavelengths and appear to us now as infrared light. The video was created to help explain how NASA's next-generation James Webb Space Telescope will work. The Webb observatory includes three types of "science instruments" that record images and spectra. The video explains how scientists will use Webb's cameras and spectrographs to investigate the first stars and galaxies that formed in the universe, how the universe evolved, how stars and planetary systems form and what they are made of. Stephanie Smith, lead graphic designer at STScI said,"When it came to picking a style for the animation, we knew we'd have to keep it simple because we were covering so much material. We also wanted something a little different from a lot of the science animation out there, so I used software to create something that looks like cut-paper animation, a style that lends itself well to adding funny little details in the background. I tried to keep the feel of the pencil drawings that it all started from in the finished artwork." Smith said she remembers short educational cartoons and tried to model the video like that: something short, catchy, and fun, but full of solid information. Because the video is easy to understand, STScI and NASA hope that people enjoy it, learn from it, and share it. Uhhh, Hello, ...and exactly WHEN do we expect to see images from this wonderful new device??????? ?